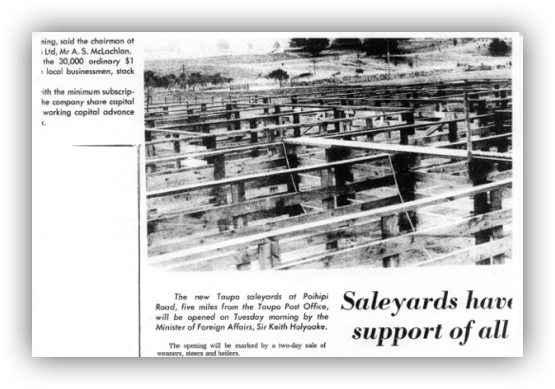 In the late 1960’s the need for Saleyards in the Taupo area was recognised. The Taupo branch of the Federated Farmers initiated the project, with the support of the Stock & Station Firms, Department of Agriculture, Maori Affairs, Lands & Survey & the Taupo District Council. At that time the nearest saleyards were at Ngongotaha, Rotorua. 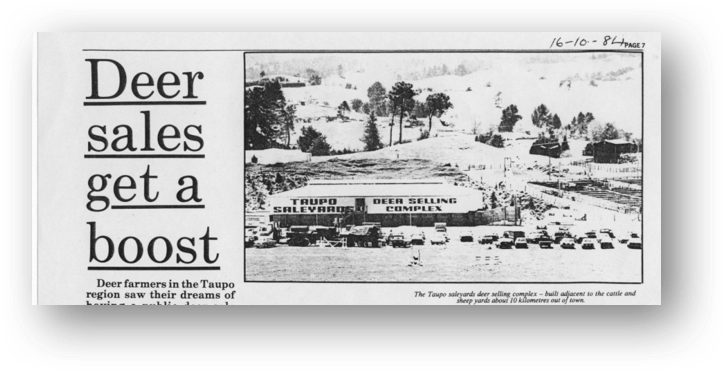 In 1970 The Taupo Council acquired 51 acres from the government on Poihipi Road some 5 miles out of town, on the condition that the land be used specifically for a Saleyards. The newly formed Taupo Saleyard Company leased 41 acres of this land in December 1971. 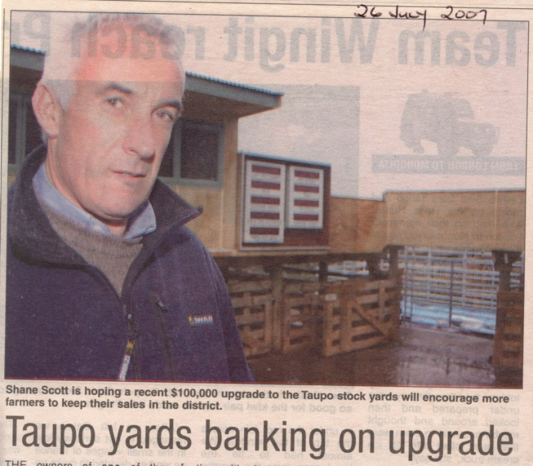 The Taupo Saleyard Company was established with 30,000 One dollar shares that were taken up by some 90 local farming families in addition to stock firms, carriers & local businessmen. Building of the cattle yards commenced in early 1972 and were completed in time for the autumn weaner calf fair. The cattle yards were designed to hold up to 3000 adult cattle. The cattle yards featured a selling rostrum that was fed by four races. It was envisaged that 1000 weaner cattle could be sold per hour. The construction of the sheep yards was completed in early 1973. The original directors of the saleyard company were: Mr A.S. McLachlan (Chairman), Mr R.H. Holyoake, Mr J.A. Johnson, Mr E.P. Lowry & Mr D.C. Wilkie all whom were farmers. Mr L. Hocquard, manager of Newton King, Rotorua represented the Stock Agents Association as a director also. The Taupo Saleyard Company was set up to act as a landlord only. Income was to be derived from a share of the commissions of the sale of stock by auction through the yards. Through the 1970’s large numbers of weaner cattle were sold at the annual weaner fair’s on behalf of Farmers, Lands & Survey & Maori Affairs Blocks. Numbers peaked in 1974 with a record number of 10,500 weaner calves being sold over 3 days. Due to the numbers Lands & Survey had their own day and sold 4000 calves. In 1974 the top weaner steer price was $113 for a line of 44 Angus Here X on account of Mr D. Cotton. Prices ranged from $113 down to $30 and Heifers ranged from $79 to $20. By the late 1970’s weaner fair numbers ranged from 7000 to 5000 head. The rise of Deer farming in the early 80’s saw the development of many Deer farms in the region. The need to be able to hold Deer sales was recognised by the Saleyard Company and plans were made to build a Deer selling complex. There was debate amongst the directors as to whether the existing cattle yards, be covered and adapted to handle deer or a new purpose built complex be constructed. The later was decided upon. Plans were drawn up. The Saleyard Company set about raising the $125000 required. Financing was arranged through DFC (Development Finance Corp). To fund the building, a share issue was released offering a further 50,000 $1 shares at a purchase price or $2.50 per share. Construction of the fully dedicated Deer selling complex was completed in October 1984. Deer farming continued to boom during the mid 80’s with many city investors taking advantage of livestock value, tax breaks. To this end Goat farming also flourished at this time with skyrocketing prices. In 1987 the saleyard company decided to spend a further $30000. Adding an extension to the Deer complex to accommodate Goat Sales. The budget of 1987 saw the laws on livestock tax change and investment incentives were wiped out. This had a massive effect on both the Deer & Goat industries with values plummeting. As a result by the end of the 80’s and early 90’s, returns to the Saleyard Company from the sale of Deer & Goats through the complex were minimal. A drought in 1987 and low stock prices saw the Saleyards struggle to attract numbers. With monthly sale after sale being cancelled. The exception was the Ewe and Weaner Fairs where big yardings were still common. The Ewe Fair of January 1988 saw the record number of 26,000 Ewes sold in one day at the yards. Ewes were not only sold in the sheep yards but occupied most of the cattle yards as well. At the Weaner Fair in March of 1988. Weaner Steers made from $328 to $280 for tops and $279 to $250 for mediums. Weaner Heifers made $251 to $200 for tops and $170 to $140 for mediums. All of this aside the downturn of farming in the late 80’s and poor returns from the Deer & Goat complex had seen the saleyard company run at a loss for several years. Faced with a financial crisis a further 27,250 Shares were issued at a price of $2 each. With only 1/3 of the share offer being taken up, things were looking grim. Owing $94,000, in 1988 the directors at the time came to the rescue and personally guaranteed the debt. By 1991 the mortgage had been restructured and reduced from a peak of $105,000 down to $35,000. By the mid 1990’s the saleyards were floundering with the facility only being used for the main annual fairs and the odd deer sale. Maintenance and upgrading of both the sheep and cattle yards were overdue and badly needed. In 1995 a Taupo based independent livestock company “Central Livestock Limited” was formed. 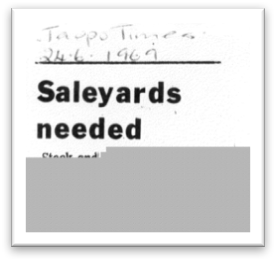 In 1996 the Taupo Saleyards were approached by Central Livestock Limited requesting permission to run a monthly “Stock & Sundry Sale” at the yards. The sale was to be held on a Saturday and accommodate the needs of the many lifestyle blocks in the district. Permission was given and by the late 90’s the Stock & Sundry Sale had grown into a popular monthly event. In 1996 Central Livestock also applied to sell on calendared sale days alongside the existing stock firms. After objections from the stock & station companies were heard. The directors of the saleyard company agreed to grant Central Livestock Limited the right to sell on calendared sale days. The conditions of the agreement were that a bond be paid to the saleyard company by Central Livestock Limited, with a review after 1 year. At least 1000 shares were required to be purchased by Central Livestock as well. 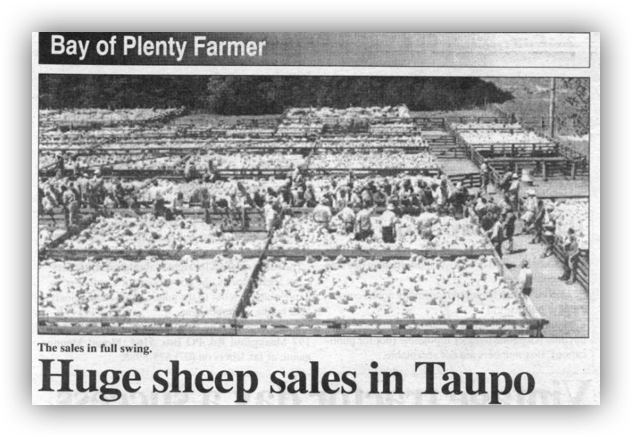 In 1997 the Taupo Council were entertaining the idea of selling the land that the Taupo Saleyards leases. Both Mercury Geotherm and Contact Energy were after the site. In April of 1998 after much debate the terms of the original purchase of the land from the crown by the Taupo Council were upheld. That was that the property must be used for the purpose of a Saleyards and if that did not occur then the land would be returned to the crown. The Weaner Fair of 1998 saw 1750 steer and bull calves sold with the top price steers making $420. Prices for steers ranged from $420 to $280 for the main lines. 1280 Heifers ranged in price from $262 to $180 for the main lines. At the Ewe Fair in January 1999, after another period of low sheep & beef returns 23,000 Ewes were yarded. 2ths made from $68 to $61 and 5 year Ewes $47.50 to $40. A large number of capital stock ewes were sold at this sale. Due to dairy conversions, forestry and changes of farming policys. The reduction of sheep numbers in the district would signal the end large ewe fairs in the future. From 2000 onwards sheep numbers sold through the saleyards have steadily declined in line with the reduced numbers in the district. Cattle sales have steadily increased. Numbers at weaner fairs have remained static. However in 2005 Central Livestock Limited reintroduced a monthly “Stock Sale” in addition to the monthly “Stock & Sundry Sale”. The Stock Sale was calendared for the 2nd Thursday of each month. 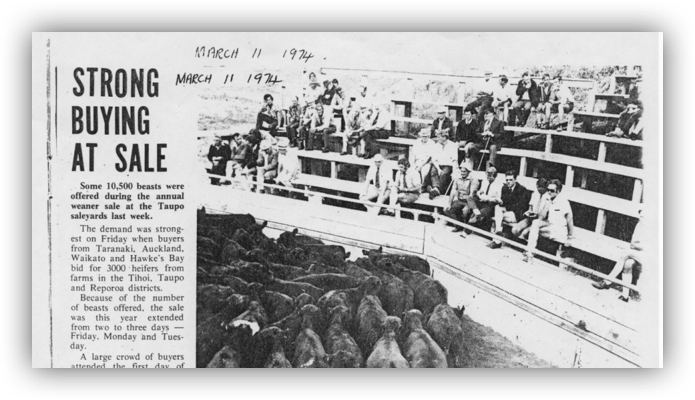 Other local stock firms were invited to partake in the monthly sale, but preferred to send most of their cattle to selling centres outside of the district. Central Livestock kept persevering with the monthly sales regardless. At the end of 2006 Shane Scott the managing director of Central Livestock Limited and a director of the Taupo Saleyards Ltd. Made it quite clear to his fellow saleyard company directors, that unless the Taupo Saleyard Company installed a liveweight selling system into the cattle yards, the saleyards did not have a future. In early 2007 the project to install a liveweight selling system was given the go ahead. The original budgeted cost of the project was $80,000 but ended up at closer to $120,000. Funding came from reserves plus a $40,000 loan to be guaranteed by present and past directors. The term of the loan was 5 years but it was repaid in 2 Years. The liveweight selling system bought the saleyards into line with the larger selling centres such as Te Kuiti, Rangiuru & Stortford Lodge. The first liveweight cattle sale held was on August the 15th 2007. If it were not for the efforts of Central Livestock Limited to introduce & rebuild regular sales at the Taupo Saleyards. The facility would have suffered the same fate as most other regional sale yards and ceased to be in existence. Instead a steady cash flow generated by the regular sales held by Central Livestock Livestock Ltd has enabled the Taupo Saleyard Company. In addition to regular maintenance. Undertake since 1998 the following projects required to bring the yards up to: The Top Facility that it is today. Going forward from 2010 Taupo Saleyards Limited stands in good stead. The company is in secure financial position with no debt and reserves in hand. – The lease of the deer selling complex that has been gutted and is now used for storage. – The lease of the facilities’ for use by the local trucking company. – Moderate leases paid by the Pony Club and Western Riding. – The lease of the truck washing facility. The challenge for the future lays with adapting to the changing farming landscape in the Taupo and Central Plateau District.